BADGERS GOAL: Luke Kunin scores his 19th of the season after UW patiently waits for an opening on the PP. PSU leads 3-2 with 2:33 left, 2nd. 3-2 with 2:32 left in second frame. Cameron Hughes extends his point streak to 10 games with the primary assist on Kunin's goal. END 2: Penn State leads Wisconsin 3-2. Shots on goal were 15-9 for PSU in the period. End 2: 3-2 Penn State leads. Rough period for the Badgers but they get it within one late. Minnesota and OSU are now tied 4-4. Badgers and Nittany Lions back out for the final period. Badgers find themselves down 3-2. Final frame now. 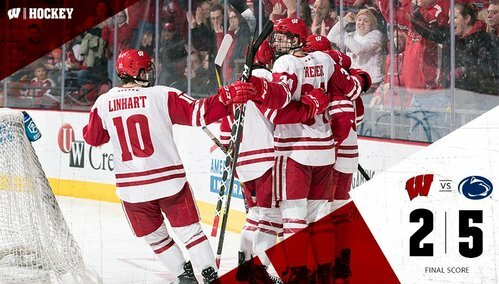 Biggest period thus far for this Badgers' season. Penn State leads Wisconsin 3-2 at the start of the third period. PSU had 28 attempts in the second to UW's 15. Hughes back up with Frederic and Kunin in the third. Penn State sneaks one through Jurusik to make it 4-2 with 17:07 left on the clock. Beat Jurusik five hole on a breakaway. NITTANY LIONS GOAL: Denis Smirnov scores on a breakaway after forcing Frederic into a turnover. 4-2 PSU with 17:07 left in the third. Two goals, two assists tonight for Denis Smirnov. First 4-point game for Penn State. He had 0 point in last 5 games entering series. Zimmer-Ustaski-Johnson line has been the Badgers best all night. Generated a couple chances there. Kunin almost had another but a nice save by Jones keeps it a two-goal game. Kunin has a chance after catching up to a rolling puck, but Jones denies him. PSU leads UW 4-2 with 13:01 left in the third. 4-2 Nittany Lions. 13:01 remaining. Some solid chances for the Badgers over the past few minutes but they are unable to put one in the back of the net. 13:01 left in the game. Wild few minutes right there. Cavallini wanted a piece of a PSU player. Wisconsin looks rattled, confused, disarrayed. Nothing going for them. UW still trailing by two with 8:12 to go in the third period. 8:12 left in the third. PSU leads UW 4-2 and holds a 36-24 lead in shots on goal. Penn State adds another and things are ugly at the Kohl now. 5-2 Nittany Lions, 5:21 to go. PSU puts in another one to make it 5-2 with 5:21 left in regulation. NITTANY LIONS GOAL: Trevor Hamilton scores on a rebound to give PSU a 5-2 lead with 5:21 remaining. Badgers caught chasing the puck. Minnesota is currently losing 5-4 to OSU. Silver lining for #Badgers fans. 2:18 left, still 5-2 Nittany Lions. PSU has 41-28 shot advantage. It was 11-10 Penn State after the first. Penn State just had a three-on-zero and could have added insult to injury, but Jurusik made a nice save. Jurusik stops Biro on a 3-on-0 with 36.6 left, but PSU is about to close this one out. FINAL: No. 10 Penn State sweeps No. 17 Wisconsin with a 5-2 victory. PSU 10-1 in last 11 vs. UW. Badgers lose back-to-back for 1st time. Final: Penn State 5, Wisconsin 2 in an ugly one for the #Badgers . They'll be back at home next weekend against Michigan. 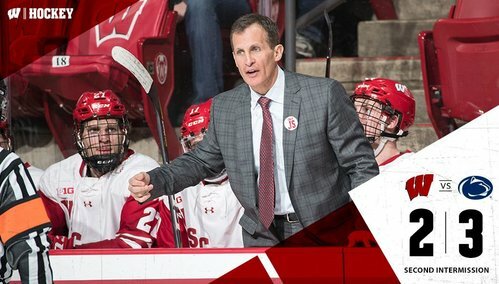 Tony Granato on UW's loss to Penn State: "This is the first weekend all year that, at the end of it, you say we got beat by a better team." UW's Luke Kunin: "From the start of the series to the end, they wanted it more than we did, and I think that showed. That's unacceptable." Penn State's line of Denis Smirnov-Nate Sucese-David Goodwin combined for 7 goals, 14 points, +18 in series sweep of #Badgers . Guy Gadowsky: "They are difference-makers, and they had a big night, but I do think it was just a great team win." This is just the first time all season that UW has lost consecutive games. Next week is another chance. ICYMI, here is Coach Sauer's tribute from this weekend. Check back tomorrow for more memories about Coach.